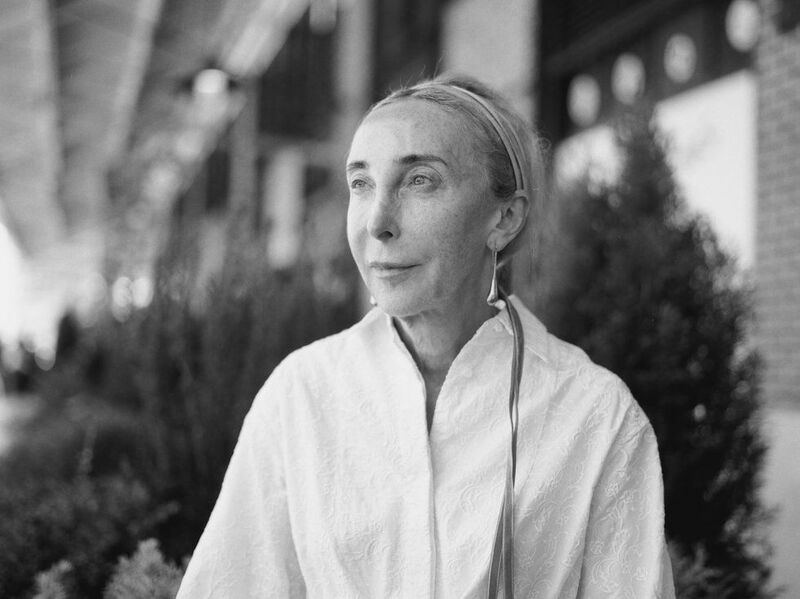 It's nine days before the boutique-gallery hybrid 10 Corso Como opens in Lower Manhattan's historic South Street Seaport District, and Carla Sozzani is inspecting the progress. The lithe 71-year-old glides across the Fulton Market Building's polished concrete floors, shuffling the ends of a pistachio-hued velvet hair ribbon from shoulder to shoulder. In a matter of days, the 28,000-square-foot former fish market will be filled with a carefully curated selection of ready-to-wear, accessories, design objects, and books adjacent to an art and photography gallery, restaurant, and outdoor bar. Opening to the public today, the fifth location of 10 Corso Como — situated at 1 Fulton Street, a stone's throw from the East River — is North America's first. Like the original in Milan and its branches in Seoul, Beijing, and Shanghai, this one has been designed by her partner, American painter and sculptor Kris Ruhs. Tables, mosaics, and glass fixtures decorated with swirls and dots of paint by the artist and the couple's friends, staffers, and collaborators, recall the warmth and attention to detail that Sozzani's retail brainchild is known for. (Left) Sozzani inside of a light fixture designed by Flos at 10 Corso Como in Manhattan. (Right) Sozzani in front of Fulton Market Building. In 1987, after years of editing special issues of Vogue Italia and its sister publication Vogue Bambini, Sozzani — whose late sister Franca eventually took over the leadership of these titles — launched Elle Italia. 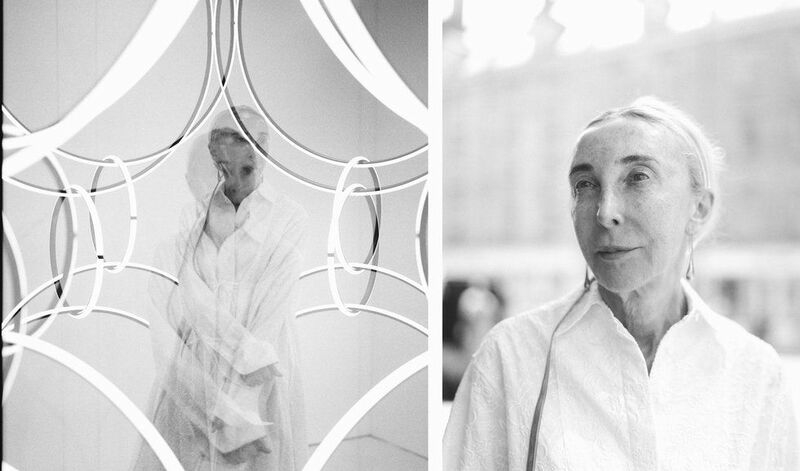 When her conceptual images and pioneering fusion of art, fashion, and design didn't take (her stint at Elle lasted just three issues), the Mantua-native decided to establish Galleria Carla Sozzani at 10 Corso Como in 1990. The following year, when a fashion and design boutique, book shop, café, and garden joined the exhibition space, the world's first concept store was born. 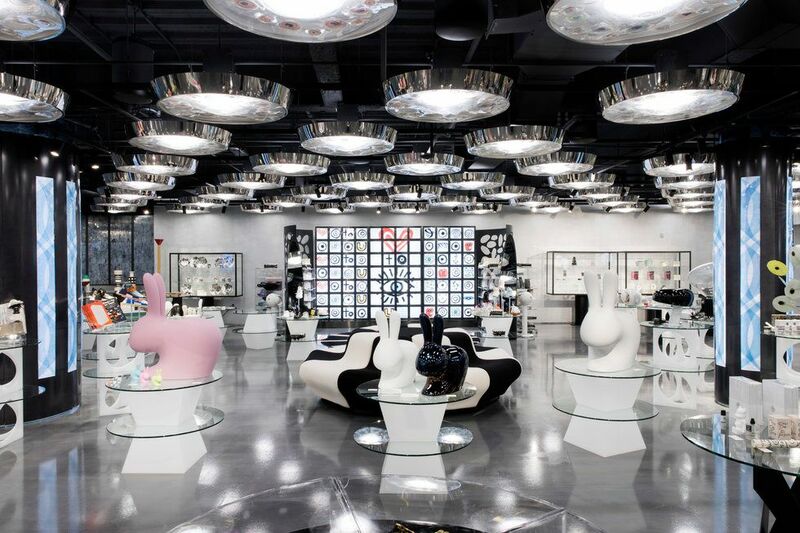 The cultural nexus point has paved the way for boutiques like Dover Street Market, The Apartment by The Line, and Opening Ceremony, and attracted an array of admirers who trek from far and wide to experience Sozzani's point of view. The trailblazer sat down with PAPER in the new outpost's expansive dining room to explain the significance of South Street Seaport, the importance of physical experiences in the digital age, and her desire to create a tranquil environment for each visitor that passes through 10 Corso Como. The main seating area in the boutique. Why did you choose South Street Seaport as the location for your first 10 Corso Como location in The U.S.? I don't know! I thought it was so far away, but Kris convinced me to come and the moment I did, I fell in love with this area. All my friends come to see me here these days and they all love it. We're in the center of New York, but all the houses around here are very low. It's a very nice atmosphere to walk around in. It's also an area with such rich history. Yes, this is where New Amsterdam started. I love the fact that the building was built in 1822 and that it was a fish market. When I saw all the fish on the walls [fish-shaped tiles applied to the outdoor bar], I thought they were so great. Kris was telling me that many artists lived here in the '60s. When we did some research, we found out that Agnes Martin, Ellsworth Kelly, and Robert Indiana all had studios here. I saw this beautiful picture of all of them on the roof right around the corner from here. It's amazing. 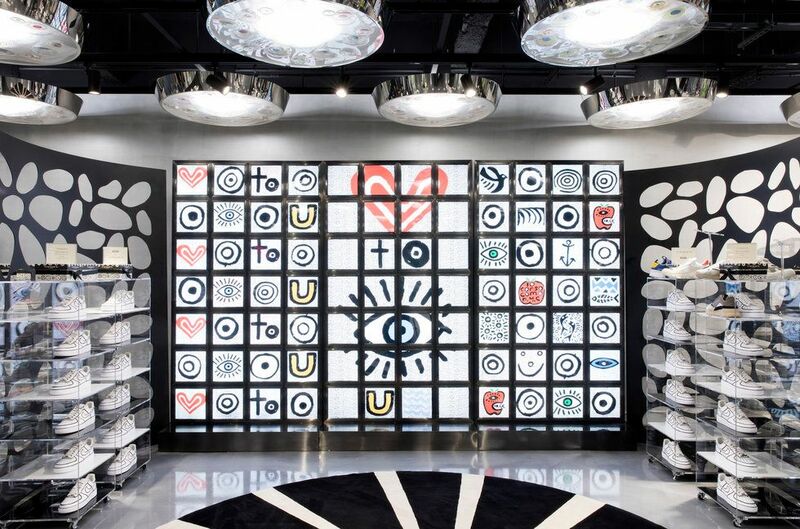 Eyes, circles, and other whimsical designs by Kris Ruhs have become a core part of 10 Corso Como's design language. This area is now undergoing a transformation and 10 Corso Como is a big part of that new beginning. I like new beginnings. When we opened 10 Corso Como in Milan, the area was considered the outskirts of the city. People were asking, "Where, are you going?" I remember my father said, "What the hell are you doing? Why would you open a place in an old garage so far away from everything?" When you set up shop 1991, your goal was to bring the sections of a magazine alive. Now that fashion, design, books, and photography are at our fingertips with the internet, has that mission changed? Strangely it's even more important today than it was then. I started 10 Corso Como because I was frustrated with magazines. There was no direct communication with the people who were looking at the magazines. There was no Instagram or internet. Google started only 20 years ago and that [the founding of 10 Corso Como] was 28 years ago. I wanted to open a direct line of communication with the visitors and get feedback from them. I wanted it to be a gathering place, somewhere people could meet, talk, share values. Communication has always been very important to me. Then, digital communication was invented. For a while, it's something that people have been intoxicated by. It's a big discovery to be able to do all these things via technology. But over the past two or three years, I've noticed that very young people have been coming to 10 Corso Como a lot more than before. When they come, they don't use their cell phones. They talk to each other, they enjoy the nature and the food, they visit the gallery. It's more important today than before because you can't have that experience through a screen. Looking into another's eyes, as we're doing now, has so much more meaning than just texting or answering your questions on a computer without ever meeting you. There's a big difference in in-person communication. Sozzani seated outside of the Fulton Market Building. With so many retailers in The U.S. struggling to keep their doors open, why did you decided to open a store in New York? The place wasn't New York. It was this place [South Street Seaport] that I fell in love with. Also, I don't think of 10 Corso Como as a store. The fashion part is a part of a puzzle that makes up a whole experience. The food, the cafe, the restaurant, the gallery, the exhibitions, design, and books, it goes beyond retail. Shopping is just a part of the experience. How will that experience be curated differently here than in Milan or Seoul? Sometimes there will be synergies between the locations. For example, my private collection is currently on display in Berlin at the Helmut Newton Foundation and through November. I thought it would be nice to have a Helmut Newton exhibition here. It depends what's going on at the 10 Corso Como, around the world, in New York City, what I feel, what my people feel. I don't like to make long term project plans because we should always have the freedom to do something interesting if it comes along. What do you hope people take away from visiting 10 Corso Como? Ultimately, I hope people walk out and say, "I wasn't feeling good today, but now I feel better." That is the best compliment. I want to share this calm and serene atmosphere, a feeling of home, that I think is very important in life.